This is one of my favorite Konkani dishes. My Aayi is an expert in preparing this. Since we add cumin seeds(jeera) and pepper(miryakan) to this, it is good for health. I used to eat a lot more when this dish was prepared. I love to pair this with some lemon pickle. A lot of garlic is added to this gravy to give that amazing aroma. Heat oil and fry cumin, pepper and red chillies. Grind with coconut, tamarind and salt. Heat the ground masala with sufficient water(to a consistency of sambar) for 10min. Heat oil in a pan. Add garlic, when they turn to brownish, add to the cooked masala. Serve with hot rice. I love this dish, usually I like it with rice and potato talaasani, and cucumber kosumbari and a nice papad for some crunch. Nice recipe.. havent had it in ages.. will make some soon. Just wanted to mention you have a typo- miryakan is pepper -please change that! Thanks Sudeepta for pointing it out. I have changed now. I have to be more careful next time. Hey sounds nice. When I was at a Primary Heath centre in January, the lady out there used to make a preparation of prawns called “jira miryatli kolambi” (Kolambi is prawns in Marathi). She ofcourse wasn’t an Amchi lady but I had asked her the recipe and it was somewhat similar to this. After the coconut etc was ground to a paste(she used dried coconut), she fried prawns with oil and onions and then add the “curry” and cook it further. Was heaven! I have just started learning to cook. My query is, is tumeric added to this dish, coz my curry does not look bright yellow like yours? no turmeric — it has a reddish-orange-brown color. Normally we use a type of chili that has a bright color (Byadgi) if that’s not available I use regular chili and add a bit of sweet Hungarian paprika which gets he color. I am just learning to cook. My query is, is tumeric added to this dish, coz my curry was not bright yellow? Varsha, thats a good one. I will try it next time. Any prawns dish is welcome in my home. Carol, I didn’t add turmeric. The color largely depends on the type of chilies used. My chilies don’t give a bright red color, so it looks yellowish in the picture. I prepared the curry for today’s lunch. It turned out very nice. I added a little turmeric to enhance the look. My mom adds Avlaa during grinding since this recipe is supposed to have curative power for indigestion. I like your website a lot and it has motivated me to be a good amchi cook. This recipe reminds me of what my grandma used to make, Tried it for dinner tonight & loved it. Thanks for helping me reconnect with my childhood !!! Nice recipe! My mom used to make it..yum!…I am going to try this soon. Thanks. Jeer-mirya kadi is awesome. However, I think it tastes better without garlic; garlic cuts into the aroma of freshly-roasted pepper and jeera. i used to prepare jeeremiri curry without corriander i an happy that i can add corriander also. wonderful . Wow…I love jeerameera kadhi…My mom used to make this usually every sundays….Gr8 blog Shilpa!!!! !Love all amchi recipes listed here….Keep it up!!! Having grown up as amchigele, now married into a smartha brahmin community, I have a wide option of cooking variety cuisines as my hubby loves to eat new dishes often. Dear Shilpa, i made this for yesterdays lunch and it was really good with hot rice, i did not add garlic since yesterday was a saturday but a little jaggery at the end along with curry leaves. My hus loved it very much, thanks a lot. Thank you for sharing this recipe it’s too brilliant for words. “Fast to cook & good to eat”, as went an old advertisement! My friends went quite gaga over my cooking. The credit was all yours. I made this kadhi last sunday and it was super hit in my house. in kerala Malayalees call it Pulissery. and if you add raw mango to it known as Mambazha(Mango)pulissery. Thanks a lot for sharing this recipes. My wife makes it very often for us. She adds the same grounded jeera-miryakan with coconut and red chilli along with masoor dal in a cooker. It becomes jeer-mirya varan and it is absolutely incredible! I so much love it when I suffer from sore throat and runny nose! it is very healthy! Nice Recipe, something new in Khadi Recipes. thanks a lot for posting all these recipes…god bless!! I can always get all the recipes of whatever my mom used to make…though she used to add pomegranate skin to jeer-mirya kadi at times as it is good for an upset tummy….do you know how I can include that in this recipe? Do I roast it or add it anyway…. You can put little shell along with coconut and grind. Or u can also, dry roast, powder and then put in kadi.. Thank you so much Anjana. I made this today and it’s one of my favourite dish.. I belong to himachal but my husband is konkoni so I learned most of the dishes.. if you add small piece of pomegranate dry shell powder, the dish comes out really tasty.. she’ll is good of digestion, cold etc..
Pomegranate shell should be kept in sun for some time and then store it.. to use it in the dish, tAke out little and dry roast on tawa. Then grind it by using motor and Pestle. 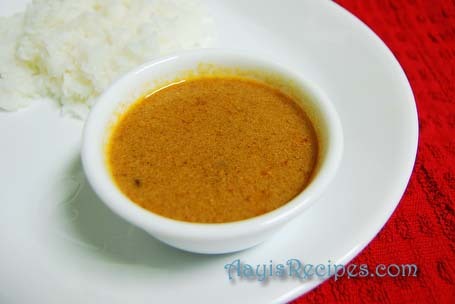 .. you can also gringo it along with the coconut masala..